In Literary Remains, Eileen J. Cheng argues that the conventional history of modern Chinese literature and the prevailing image of Lu Xun as a May Fourth iconoclast have obscured not only an intense period of cultural disintegration and transformation but also Lu Xun’s complex psychological state, literary choices, and his persistent engagement with classical traditions. This study is revisionist in at least three ways: it debunks the received version of modern Chinese literary history founded on a singular, teleological understanding of temporality; it makes visible the dynamics of traditional literature and culture in Lu Xun’s creative work; it complicates the conception of modernity, highlighting its richly ambiguous relation with traditions. The overriding virtue of Literary Remains is, then, the strength attributed to the past. Traditions, Cheng argues, contain a wealth of resources for, rather than an impediment to, modernization. Cheng emphasizes Lu Xun’s “transformative” engagement with these resources and traces various modes through which Lu Xun drew upon classical traditions in his “modern” works, including “means of allusion, imitation, adaptation, and parody” (6). Through her comprehensive and illuminating discussion of a wide range of Lu Xun’s creative writings, Cheng also reveals how Lu Xun’s interaction with the past is simultaneously an aesthetic, ethical, and epistemological engagement. Literary Remains draws on two crucial theoretical sources to assert the strength of the past: Walter Benjamin’s sense of Messianic time and psychoanalytically-inflected trauma theory. The heart of the book conveys how the past still offers insights in the present and even redemptive possibilities—“radical hope”—for the future (15). Cheng also ingeniously brings trauma to bear on cultural transformation and Lu Xun’s literary creativity. The central leitmotif of “refusal to mourn,” as embedded in the subtitle, is defined as “Lu Xun’s refusal to mourn the passing of tradition and his insistent rearticulation of its fragments” (10). This stance is in truth a variety of melancholy,  particularly in regard to the relation between Lu Xun and tradition, though Cheng correctly and perceptively articulates its ethical significance. 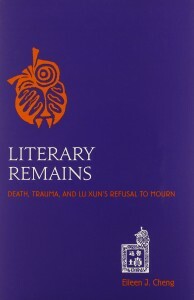 If mourning entails being reintegrated into the framework of meaning, Lu Xun’s “narratives of incoherence, contradictions, and uncertainty can be seen instead as a rejection of communally sanctioned ways of meaningmaking, a refusal to apprehend the world through teleological notions of history, which opens up imaginative possibilities of comprehending the past and present without necessarily reifying them” (9). Such is the radical moral vision associated with melancholy. The prologue of the book forms a lucid envelope with the epilogue. Two memorable images have emerged from Cheng’s discussion and convey a resonant tone that is at once mournful and hopeful. In the prologue, Cheng highlights Lu Xun’s favored image of the owl and shows how it is simultaneously linked with death, trauma, and a bygone age, as well as with life and prophetic wisdom. In the epilogue, Cheng examines the image of a subject witnessing his own corpse in Lu Xun’s essays and emphasizes “an uncomfortable simultaneity” of “being at once the living and dying” (229). Cheng tells us that Lu Xun underscores “the paradox of self-destruction as a necessary means to regeneration” (230). Cheng also shows how Lu Xun, through the image of the corpse, complicates the issue of narrative representation. While delving into the violence of commemorating the dead, he validates the necessity of representation for its “prospect of transformative change” (226). The first section of the book contains three chapters under the title of “Re-membering the Past.” It deals with Lu Xun’s apprehensive grappling with the past and the poetic influence of the literati tradition set by the Grand Historian, Sima Qian. Chapter 1 explains how Lu Xun’s textual obsession with death is not only reflective of the violence of his time, but also a conscientious choice of refusing to mourn, of attempting to amend the perceived failure of literature in addressing the loss and suffering of others. This is also an author’s introspective journey: Lu Xun painfully dissects himself and confronts his own complicity in the violent order of representation. In Chapter 2, Cheng guides our attention to Lu Xun’s engagement with preface writing, his evocation and defense of Sima Qian and praise for the Records of the Grand Historian. Cheng vividly portrays how Lu Xun, with much ambiguity and anxiety, establishes his imaginative identity as a marginalized literati by associating himself with a genealogy of ingenious and sorrowful literati traced back to Qu Yuan. Such identification results from Lu Xun’s deep sympathy toward the ethical commitment of the literati tradition. In chapter 3, Cheng analyzes the fruitful influence of Sima Qian on Lu Xun, particularly with regard to his biographical writings. She exposes us to Lu Xun’s poetic world, where the marginalized and unrecognized characters, such as his friend Fan Ainong and the fictional character Ah Q, are heard and remembered. The second section of the book, titled “New Culture through the Prism of Tradition,” is devoted to Lu Xun’s critique of the commercialized representational forms in the New Culture movement and the shallow distortion of classical traditions in the new literary scene. Chapter 4 incorporates the perspective of women into Lu Xun’s well-known hostility toward spectacles and accentuates the significance of gender in Lu Xun studies. Drawing on abundant resources, including Lu Xun’s representation of the female revolutionary Qiu Jin, the actress Ruan Lingyu, the student Liu Hezhen, and the letters between Lu Xun and his wife Xu Guangping, Cheng explicates Lu Xun’s great concern over the exploitative images of women rampant in new popular culture. At the same time, Cheng ponders whether Lu Xun evinces a patriarchal sympathy toward traditional ideals of femininity. “Lu Xun’s inscription of a categorical victimhood on women’s bodies and his narrative erasure of women in his stories,” concludes Cheng, “precludes the possibility of women’s agency” (107). The exploration of romantic love in a time of cultural change is central to chapter 5. Cheng interprets Lu Xun’ poem “My Lost Love” and short stories “Regret for the Past” and “A Happy Family” as polemical parodies of modern romantic poems and popular fiction, respectively. These textual performances illustrate Lu Xun’s condemnation of the modern literary incarnation of love: how it possessed no alleged revolutionary significance and was a degradation of and estrangement from the tradition of classical poetry. Chapter 6 analyzes the contrasting images of home—a prominent trope in classical poetry—found in Lu Xun’s early poems and stories written after his return from Japan. Between the tranquil and dystopian visions of home, suggests Cheng, wanders a nostalgic intellectual who rejects the double illusions of an idealized home in the literary tradition as well as in the progressive narrative of modernity. The third section, “Dialogic Encounters,” is developed through two chapters and addresses Lu Xun’s appropriation of classical legends, myths, and fables in Old Tales Retold. Chapter 7 explores Lu Xun’s ambiguous relation to the past and his creative act of surmounting traditions. Cheng makes a convincing argument for the connection between Lu Xun’s “Gathering Vetch,” a rewriting of Sima Qian’s biographies of Bo Yi and Shu Qi, and the poem “Gathering Vetch” from the Book of Odes. This reading illuminates how Lu Xun’s narrative act of mocking sages and rendering them ludicrous fools is linked to his sympathy toward the silenced suffering of the poor. Chapter 8 deals with Lu Xun’s interest in what Cheng calls “experiences of enchantment” that include “myths, legends, and supernatural tales that tap into the divine and imaginative world beyond” (193). With remarkable sensitivity and sophistication, Cheng demonstrates that in Lu Xun’s revisions of the Nü Wa myth and a Zhuangzi fable, we encounter not a hallowed and awe-inspiring world, but one of disenchantment and alienation. This twist shows perhaps not Lu Xun’s pessimism; rather, it reflects his wariness of reviving the past for entertainment. Cheng’s argument here is a thematic echo to the second section of the book: for Lu Xun, traditional conventions, when taken out of context and transplanted into the alienated soil of modernity, became sources of embarrassment, insincerity, and even hypocrisy. Elegantly written and closely argued, Eileen J. Cheng’s Literary Remains is a joy to read. The book’s achievement lies in both its historical criticism and Cheng’s attunement to the details of Lu Xun’s creative work. It has undoubtedly reanimated the fascinating, liminal period of early twentieth century Chinese literature. Cheng’s subtle knowledge of texts and her impressive range of sources are an important resource for anyone interested in modern Chinese literature and temporality, cultural change, the evolution of literary traditions, and the dialectic between past and present. Scholars in recent years have studied the influence of traditional literature and culture in Lu Xun’s work. Cheng’s book substantially contributes to this field of inquiry by examining not only Lu Xun’s classical style poems and meditations on traditional literature, but also his creative writings, which are conventionally designated as modern. As defined by Freud, mourning and melancholy are two responses to the loss of a loved object and to the mourner’s unconscious ambivalence toward the object. In the case of mourning, the subject mourns over the lost object and redirects his libido towards a new object of love. In the case of melancholy, the subject dwells guiltily on his loss of the object and narcissistically transforms the object loss into an ego loss. Cultural critics such as Cathy Caruth and Dominick LaCapra have drawn on these two concepts in their discussion of historical traumas. Whereas mourning is seen as a social-political process that binds historical losses into a stable meaning system, melancholy renders the ruins of the past into a permanent landscape where the traumatized linger.